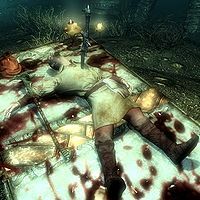 Rahd, also known to his fellow bandit compatriots as Longhammer, is a Breton who has been slain by the Falmer at the furthest section of the Liar's Retreat Den. He was serving as the barkeep there until the Falmer tunneled in and attacked. It appears that he has been heavily tortured and a Falmer sword has been thrust into his abdomen, just below the sternum. Next to his body, you can find The Longhammer, a unique warhammer. It has a 30% greater attacking speed than other warhammers, eclipsing even the mighty Daedric warhammer in damage per second, making it one of the most powerful weapons in the game. Rahd can be found wearing some barkeep clothes along with a pair of shoes. He carries an iron dagger along with a small chance of also carrying a small amount of gold or a lockpick. The Longhammer may glitch underneath the table, not next to him. This page was last modified on 1 August 2016, at 08:28.